Hello, good morning or good afternoon, everyone, depending on where you’re joining us from, and welcome to today’s webinar. My name is Tareq Audhali from Business Review, and I will be your host today. 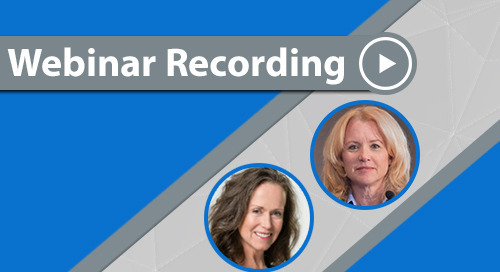 It is our pleasure to have CRF Health with us, who will be presenting this webinar, which is titled Monitoring Clinical Trials with Electronic Informed Consent. Today’s guest speakers are Sandra “SAM” Sather, Regulatory and Quality, CRF Health; Elizabeth Weeks-Rowe, Clinical Research Consultant; and Deborah Rosenbaum, President, Sarrison Clinical Research. We’ll be hearing from them in just a moment. First of all though, I’d like to welcome you to the platform. This is ON24 webinar platform, and this webinar platform is fully browser based. So that means, if you do disconnect for any reason, just click the link you received via email to immediately rejoin the session. All of the icons along the bottom of your screen are the interactive widgets that we have on offer today, so please interact with them all throughout the session. You can ask questions using the Q&A widget or by using the questions box at the top left of your screen. We’ll try to get through as many questions as we can once the presentation has concluded. Use the help widget if you experience any technical difficulties, or require any more assistance. You can also move, resize, and maximize any of the windows in this front view if you need a better view of the slides. If you want to zoom in or go full screen on the slides, you can do that as well. But now without any further ado, please allow me to welcome our first speaker. So Sam, over to you. Thank you so much. Hi everybody. Welcome and thank you for joining this really exciting webinar today. We’re going to discuss monitoring clinical trials related to electronic informed consent. I have the great pleasure for today to be presenting with two wonderful industry leaders and experts in informed consent. And what we’re going to discuss today is the burdens and challenges that we have in informed consent. And then we’ll also go into what would be the considerations if eConsent were added into a project that monitors were working on. And then we’re going to discuss as well what might be the advantages of using eConsent for a trial, related to the impact on monitoring again. And then finally, what would be some implementation key considerations that you should think about related to monitoring when a project has electronic consent included. We’re going to have a Q&A session at the very end, but we’re also going to have polling through the presentation. So here’s our first polling question, if you could answer the following, and answer it to the best of your situation. What’s your experience with eConsent? Please remember to click on submit when you’ve answered the question. Have you never used eConsent? Have you used eConsent for less than five studies? And maybe more than five studies? So be sure again to click on submit. This information that you provide for us during the presentation very much will help the flow of the information given. So again, we’re going to discuss the impact of eConsent on the monitoring of program, as well as also monitoring the processes at the research site. So we’re just about done with the polling, we have a few more seconds to go. What would be the best answer for your situation? What’s your experience with eConsent? Based on the audience that answered the question, what we see here is, what is your experience with eConsent, the majority, 86%, have never used eConsent. So then the second place is that you’ve used it for less than five studies, and then the next is that we see those that have used it for more than five studies, so that’s the minority. This is not surprising, but we do expect that the amount of experience that we will see in eConsent will substantially grow. We’ve already seen it actually in just the last couple years. 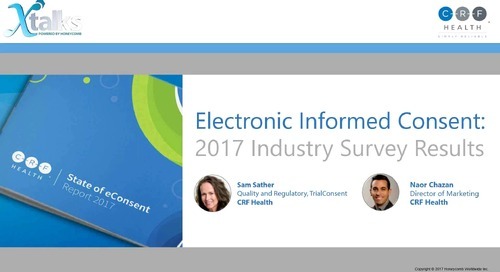 So related to that, there is a growing set of information that’s getting larger and larger in the industry related to some of the experiences with eConsent. We know that from some polling that’s been done from various groups, for example like some IRBs, some research institutes, etc. (Applied Clinical Trials, for example), for the sites that have been polled in some of these surveys, there is a feeling that the workflow, the burden on a site, will be something that will be improved and will improve the consent process. As well, we know that presenting information in a consent process in multimedia can very much help support the comprehension for those that are going through the consent process, our subjects. So there is a growing interest definitely from a sponsor perspective, operationally, looking at efficiencies and the definite ICH E6 (R2) update related to quality risk management and doing risk-based approaches, could this help our risk-based monitoring? As well, in 2016, Transcelerate Biopharma did a really important global survey and got a really good response for how many countries globally have submitted eConsent in their submission to regulatory authorities. And the survey, for those that answered, said that 29 different countries basically have had submissions. Just recently, Transcelerate has released a second survey, so the sister survey to this, that is open now. So we’ll get some more updates to see how much change there’s been in the use. So there is more information out there about the experience with eConsent. But this topic related today on how it impacts the monitoring of clinical trials is very very much an important topic and of big interest. So without further ado, I want to introduce you to our great panel today. First of all, I’ll just do a quick introduction of myself. I’ve been a monitor for about 20 years, have monitored lots and lots of consents. 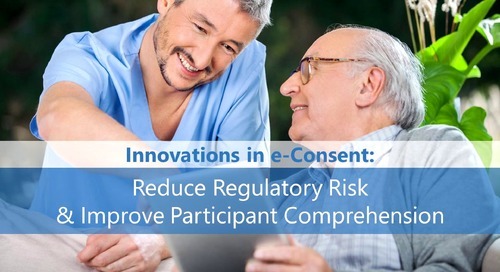 I’ve had the opportunity to monitor studies that were using eConsent, as well I’ve had the pleasure for the last couple years working with a technology company that is developing and has released an eConsent solution. And then, my master’s in adult learning theory and technology integration in clinical trials. And without further ado, I’d like Elizabeth, could you introduce yourself? Yes, hello everybody, thanks for joining, I appreciate it. My name is Elizabeth Weeks-Rowe, it’s a pleasure to be here today. I’ve been in clinical research for about 18 years, a lot of that working as a monitor as well as a CRA manager and CRA trainer. I’ve monitored at large academic health centers that had multiple consent versions and network satellite sites that used multiple consent versions. So I’ve seen issues with safety missing from the informed consent templates, a lot of paper issues. And I’m excited for the use of eConsent because it can help eliminate issues of missing verbiage, ensure safety information in informed consent. 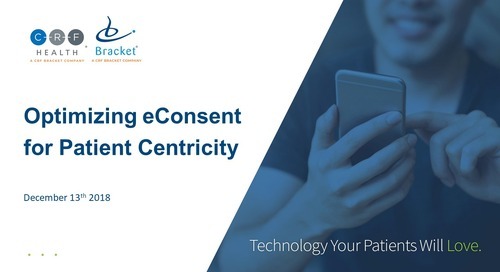 I’ve done a lot of research on eConsent and the benefits with the clinical research guidebook, updates on the book that I wrote a couple years ago, and I’m excited for the impact on patient safety and education that’s going to come with eConsent. Great. Thanks Elizabeth. And how about Debbie? Debbie, you might be on mute. I’m sorry, you’re right. Hello again, everybody, and thank you Sam. In my over-35-year career in clinical research, I’ve had a lot of opportunities to monitor in a variety of settings. But over that time period we keep seeing the same issues coming up with paper consent. Informed consent process is one of my passions, I’ve given numerous presentations on the informed consent process, so I’m very very excited to be involved in today’s talk and share some of that experience with you. I also conduct a lot of training in the clinical research profession, as well as being a published author and subject matter expert. So again, I think that this is a very exciting time in our industry. Absolutely. And thanks Debbie and Elizabeth. Let’s get started. We have three main sections in our training today. The first one, I have the opportunity to interview Elizabeth and Debbie related to the informed consent challenges that we currently have in the industry. And just to set the stage, we know that monitors have a complex multi-faceted role, just from overseeing remotely and on site. But there’s many many different responsibilities, and that responsibility to very much oversee and give good mentoring and guidance related to quality in clinical trials. But the role can be daunting and very very hard work. So the kind of roles that a monitor plays—think of from trainer to facilitator, troubleshooter, negotiator. And in that context, I wanted to ask, Elizabeth, in your great experience, what are the burdens in informed consent or monitoring programs? Great question, Sam, I appreciate you asking it. In my experience as a CRA manager and a monitor, I’ve taken part in and observed many tasks facing monitors on site, completing the many duties that have gotten increased with the advent of new technology and new regulations. For example, tracking down a source related to informed consent review, paper versions, all cumbersome responsibilities that impact time management and deadlines on a site, which in this driven industry, deadlines are everything. Like in oncology studies, having to look at multiple consent versions, documenting informed consent process, re-consenting. It really impacts the monitor’s time on site related to getting tasks completed like drug accountability, TMF review, and it can actually prohibit a monitor meeting deadlines. Having a tool that would really assist in completing these tasks and meeting the deadlines would be a wonderful thing, because it’s difficult enough trying to get everything done. Great. And you know, related to the monitoring programs, and when you see monitoring plans that you’ve worked with, I assume that monitoring informed consent is then a big part of the responsibilities. Is that true still for paper? It absolutely is true. Monitoring the original informed consent, monitoring any re-consent, monitoring the pre-trial consent, it’s increasing especially with informed consents growing in language, how long they are. And it’s a really big additional burden that can impact a lot of things and take a lot of time away, because its so important. Yes I agree. Well thanks for that. And then piggybacking on that, talking about the challenges of informed consent related to monitoring programs, what about, Debbie, related to the paper informed consent, challenges from the actual day-to-day monitoring? What do you think about this one? You know, as I mentioned earlier, we do see the same issues over and over. So the monitor gets on site and, you know, the study has been enrolling for three months, they probably already have 20 or 30 patients on study. And you’re starting to look at the informed consent, you’re finding incomplete consent forms, the wrong version has been used, there are personnel obtaining consent that you’re not aware of, so you have to go back and make sure they’re qualified for that process, clarify that the timing of consent or re-consent for that matter is appropriate according to study-related procedure. Then of course you have to be able to verify the source document, which is often electronic medical records these days, and looking for signs of fraud, so that somebody falsified a signature, I’m sure many of us have experienced the situation where you’re pointing out an error on informed consent form and the site personnel will say, oh here, let me fix that. Well you can’t fix what the patient stated or if the patient missed an initial on a certain page. So this leads to a lot of pedalling in the background to bring things up to speed, maybe a CAPA is involved. But you know, not the ideal way of looking at consent. These are some of the common issues. The burden on the monitor, I would guess about 20% of the time on site is related to consenting issues and verifying consent, down to the detail of counting every single page, making sure it’s the correct version. So it is a very very intense process. And it’s something that needs to occur before you even look at a patient record, because of course you need to verify that the subject has not withdrawn their consent. It’s still a common finding in audit and inspection that inadequate consent has been obtained. And of course we are all working towards inspection readiness at all times. So it’s something that you really need to do in a timely manner and stay on top of. Yes I was thinking also, with Elizabeth’s comment and your comment, that because of paper there is a lot of manual tracking that monitors have to do. Think of all the different kinds of forms, we might have multiple forms. The other thing I was also thinking about when I was listening to you guys is, there is a lot of effort that has to be done proactively and then reinforced again and again related to prevention of issues. Because you named a lot of them. And that’s just the tip of the iceberg, right? 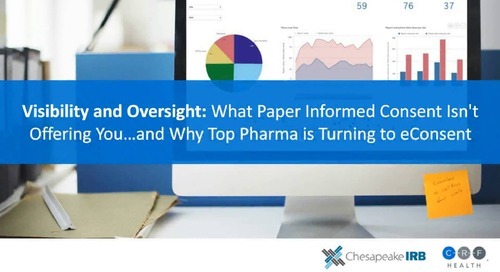 So prevention, we keep trying to be effective, and I think as an industry, we again see—you mentioned something really important, the same audit findings are happening around the world again and again. And one other thing, Elizabeth and Debbie, about this section before we go on to the next one is, I find and I don’t know if both you guys agree, there is inconsistency between monitors with how they monitor a consent. So have you ever had a site say to you the last monitor didn’t think that was important about the consent or didn’t require it. Any comment there? Yes, absolutely that’s a problem, it’s not consistent from one monitor to another. In terms of tracking most monitors will create their own spreadsheet in order to track, which may not be consistent from one monitor to the next. And there is a lot open to interpretation, and a monitor might be a little more flexible than others. So yes, that just creates another issue in the overall process. Sam, a little point about that, if you don’t mind. Something I’ve found, I’m like Debbie, I’m really passionate about patient safety and engagement. Some monitors focus on different things. I’ve been to sites where I’m looking at different signatures relative to the delegation log, and discrepancies and having sites say to me well you’re the first monitor that’s looked at this. And it’s just a conundrum about inconsistencies and quality control that I know Debbie can attest to this, so there should be a better way. And I have one more thing that I think is going to be really important for this next section for our audience. What’s required in a paper world, what should be documented related to the informed consent process? Do you agree that there is variable amounts and quality related to being able to actually tell what happened during the consent process? Do you guys agree with that one? Yes absolutely. Again, you go back to the source document to see what the site has written about the process. And oftentimes, you see a template, you know, the patient has consented, they had the opportunity to ask questions, fill in the blank with the study number. So you do have to have a lot of faith that the consent process was done correctly. So that is something that typically monitors really have a back seat to, and they again have to take faith, have to review, make sure there is a note involved, because that’s the regulatory requirements. But we really don’t get much more of a sense of what’s happening in that consent process beyond that. I agree. And Elizabeth, any words of wisdom here before I move on to the next section? Well like Debbie said it’s a matter of faith. I mean you see the documents that say a patient’s questions answered, PI or SubI available for questions. And you have to just go on your gut that the patient was adequately educated, that the patient did feel comfortable, he or she feel comfortable to ask the appropriate questions. you know, if you have a site that lets the patient take consent home and review it with family members, were they reviewing it with someone who really understands and were they completely educated. So sometimes it’s nice to have more than just—more proof in the pudding that the educational process happened appropriately. Great, thank you. So obviously, some challenges related to monitoring for informed consent in the paper world. So what if we have a study that has eConsent? And how does it affect monitoring processes and documentation? That’s the next section. So audience, we have another polling for you, if you could answer the following: Have you or your company ever monitored a study with eConsent. So now the question is more specific into the monitoring realm. So if you’ll answer, has your company or yourself ever monitored a study with eConsent. We know that the use of eConsent, you can see we have less exposure. So we might see some similar results. But it’s really interesting, I know that for those of us on the call that are presenting that have monitored eConsent, it’s a learning curve. There’s things that definitely have to be put in place to prepare for monitors to work within a monitoring plan that has eConsent. So in this section, we’ll give a good definition of eConsent, and then we’ll talk specifically how does eConsent impact your monitoring procedures, your processes, and also your documentation. That’s what we’ll cover next. So I’m going to stop the poll. Yeah, so experience-wise, has your company actually done the monitoring of it. So we know we have some people on the call that are from ethics committees and from the site perspective as well. So again, we’re going to see that in a couple of years as years go on, this polling question, that green would be in the middle and then the blue is going to be over to the right. So in this section, as we go into some specifics about the impact of eConsent to the monitoring of a trial, so eConsent is defined nicely within the FDA and OHRP Final Guidance document of 2016. And it’s very much required to still have the same requirements as paper related to the content and the considerations for special populations, etc. But really eConsent offers a system, an electronic system, that supports the presentation of the content and also very much facilitates the consent process. 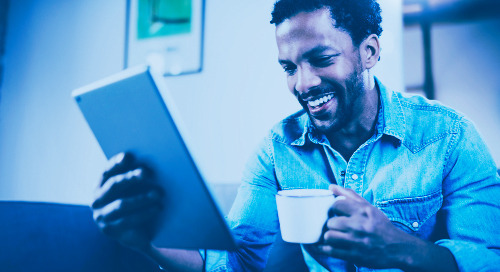 There is much that will come from an eConsent experience for participants that will very much generate informed content process documentation. So this is also in an eConsent electronic system, multimedia can be incorporated, so things like graphics and audio, podcasts, web videos, those kinds of things. So just to get us on the same page of what you might see on an eConsent, again it could be hybrid, have some multimedia. What would be manual and actually now would the system actually document. So the next section I’m going to ask Debbie and Elizabeth the following: in their perspective, related to the flow of GCP, so during pre-study, during the study, and at study close, when we have a study that has eConsent, how would this affect monitoring procedures, monitoring processes, and monitoring documentation? So Debbie, the first question goes to you. Related to things to consider and how it would impact having eConsent in a trial, how would this impact monitoring procedures? I think that, with the proper setup, there is a lot of advantages to using eConsent. But we have to first consider how do we approach this. What kinds of procedures are going to change, what tools would we have, etc. So I think at the very beginning of the study start-up, when conducting the qualification visit, one of the huge factors that needs to be considered is the site’s ability to actually host such a platform, so use of a tablet, where some training is going to be required. But just evaluating in general as part of the qualification visit, if this is something that they can actually use. And I have seen this go so far as to involving IT and IS departments and even at one site engineering, because of course this is a new instrument being brought onto their site. Within taking it to the next step when we consider study monitoring plan and how we’re going to monitor this and how it might be different, we’ll see a shift to how we verify consent from something that is conducted on site, allowing us to move into more of a central monitoring or remote monitor system, just like the EDC now, we can really review data, find errors remotely before we get on site and allow them to have more time for source data verification. Well I think in this case there is a lot we can look at electronically for this process that allows more to be done remotely and having better time management once you reach the site. But of course in our monitoring plan we’re going to have to make this shift. At the site initiation, I always consider this as a training visit. But at the SIV and investigator meetings we’re not going to have to have specific training on the instrument and the platform for obtaining consent. And of course that’s going to fall to a monitor as well. So then if you have turnover, again having to go back in and training that person. But I think all the up-front effort really becomes valuable once the study is up and going. For the interim monitoring visit, it allows you to have more time to focus on activities that can only be done on the site, as Elizabeth had mentioned, investigational product accountability and inventory, source document verification, only those things that you have access to when you’re physically there, and allowing us to do a lot more remotely and take care of things not only ahead of the monitoring visit, but also more in real time so that we can head off some of the problems that might be detected. And at the close-out visit of course the documentation is going to be electronic and retained by PDF, so we feel a little more secure we’re not going to be losing bits of paper here and there. Yes, a couple things that struck me from what you said. You know, we currently have required in the industry to have monitoring procedures as sponsors, and they’re highly reviewed and looked at in inspections. So if we have integration of new electronic systems, of course they’re going to look to see how did that impact your, like you mentioned, procedures from the study start, during, and after. And some of the things you mentioned are specifics related to the monitoring plan template, etc. So thank you for that. And piggybacking on procedures, okay, how do we actualize these procedures to process? So Elizabeth, taking what Deb said and related to how this affect procedures for monitoring, in your expertise, and I know you’ve been a monitoring manager and definitely a monitor, what about process, monitoring process changes? Well I think that it’s going to positively impact monitoring process on a lot of reasons. The intuitive ones are it’s going to impact patient safety and data integrity, but more to the processes. One thing that is really helpful with eConsent is that eConsent is built within a system. For example, when you’re monitoring the TMF then it can virtually guarantee that correct ICF version and filing in the TMF. As you know, as monitors having to track and file informed consent versions is time consuming and sometimes inaccurate. Having a tool that will help with versioning and filing is an added layer of patient safety. When you’re tracking informed consent as a monitor, tracking correct versions like Debbie mentioned before, having to create tracking tools, and with a tool that can help versioning tracking, you know, when re-consents are required. Alerts to study teams and the patients and study sites when pre-consenting is required is something that’s going to just expedite flow and help with time. Promote signature validation, speeding up the review process. If a monitor can start get the ball rolling ahead of time reviewing informed consents before the monitoring visit, it’s just going to help streamline and make everything more efficient, which is the goal of project teams and study deadlines these days. So I think it’s going to have a huge impact on everything we do to workflow and making it a lot more efficient and accurate. My question for you is related to monitoring process, we mentioned earlier some of the challenges within paper consent, some of the inconsistencies in how monitors monitor paper. Briefly, how would having to monitor eConsent affect how you might schedule your visits or train your site or conduct source data verification or report writing? These are kind of things I’ve been jotting down as you’ve been talking. Your day-to-day, how do you think it would impact, and how can we make sure that we have consistencies in how monitors do these things? I think the most important takeaway is it’s going to have a huge impact on time and efficiency. 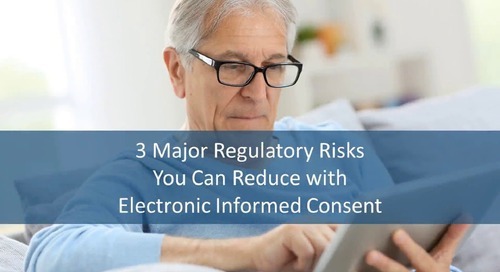 If a monitor has the ability to start the ball beforehand reviewing informed consent, it’s just going to help when they go to the site to cut down on their workload. It’s going to help with writing reports and the hours and time spent on site. Say you have a site, and you normally would have to do a two-day monitoring visit because they might have consented 20 patients, and like Debbie said, that’s a big bulk of time looking at informed consent starting when you get there, looking at issues, signature, everything. The ability to review an informed consent prior to the visit and start the ball is going to cut down on how much time you need on site. It’s going to help expedite review of the TMF with regard to the versioning and everything like that. And it’s just going to make the time burden so much less cumbersome for monitors. And getting things done quicker is the dream of every study team, so it’s going to have a big impact on that process as well. Does that answer your question? It does. And I think with the next question I ask Deb, I imagine she’ll even elaborate more. Because think about in this section, what I’m looking for as an interviewer from you guys is more how do we have to make sure that we put things in place so we have good monitoring of eConsent. So how would this impact what monitors do for documentation? I think here again is another added value. We talked about how monitors tend to keep personal spreadsheets. Oftentimes, sponsors I work with, they want the review of the informed consent included in the monitoring report, and 20-30-40 patients become a lot of pages in the report. And with the electronic consent, they can actually generate these lists for you, giving you an opportunity to dive deeper into the process. And I think Elizabeth mentioned as well that they can alert you to when there are changes, and not only are you tracking and keeping list of everyone who is being consented, but now who has been re-consented and what version was used, was there an LAR involved in the process. So is it time to re-consent because of an amendment or re-consent because a minor has become of age to consent for themselves. So there are a lot of moving pieces. Spreadsheets can be great, but this system here documents that for you far better and is doing that piece of work for you so that you can just kind of jump in from there. It documents the number consenting, consent version tracking, who is awaiting re-consent in case you have to put a reminder out there to the sites. And again, it’s happening in real time so that these things are occurring more expeditiously. You got it. And I wanted to piggyback one thing on here, that every system is a little different in the eConsent world. And so for whatever system the monitor is going to be using, or the sponsor is going to be using with the site or sometimes there are site actual systems, is some things are going to still be manual that monitors are going to have to do and some things are going to be provided by the system. And so we’ll go into that more in a little bit, but just one thing for anybody that’s on the call looking for some of the things to make sure that monitors are coached on and supported in the tools and training and monitoring plan is what do I not have to do manually anymore, like check every page that’s there, kind of thing, and what can I actually shift my focus to. So great job y’all. We’re going to get into the next part and we’ve really actually said lot of this already for these next few slides, but we’re just going to reiterate. And by the way, as we’re going through the next section, we’re getting closer and closer to the Q&A, as an audience, keep submitting your Q&A as we go along, you don’t have to wait until we get to the Q&A section. That way we can have more likelihood to answer your question during the training. So let’s talk about enhancing monitoring with eConsent. The key areas we hear a lot about with eConsent is saving time, reducing cost, and boosting efficiencies. And specifically again, in the context of this training, we’re going to talk about how this is related to monitoring. So I wanted to ask Elizabeth, in her experience, how can having eConsent on a trial help save time. And I’ll also have her answer in her opinion about reducing cost. Great question, and thanks for asking. You know, I have been to sites, large academic health institutions where they had 100 subjects and there was a team of four monitors. And we would literally spend five days a week on site monitoring, and of course this is all the informed consents were 40 pages—I’m exaggerating—but it takes a lot of time. And if we had had a tool such as this 15 years ago, we could spend a lot of that time ahead of schedule in a secure location, in a home office, in the office, reviewing the consent, the versioning, who was due to be consented, did the consent have the safety language, did they match. Like I said previously, when I monitored at a large academic health institution, we had a large informed consent issue because the network consent was missing safety language that was in the primary site consent. And having a tool that had the language and the contents ahead of time would ensure patient safety and accuracy. When you can start the ball ahead of time, looking at informed consent, addressing issues, I think Debbie mentioned previously, you cut out time not having to start that safety review when you get to the site. I mean you can’t do anything until you’ve looked at the patient’s informed consent form. You can’t look at CRFs, do anything, so if you can start the ball on that ahead of time, when you get to the site you can already be addressing and resolving informed consent issues. It’s a huge time saver for a CRA, and it would have been such a bonus back a long time ago when I was doing that. It would have saved cost, time, time spent on site, travel time, everything. So it can only make things more positive and streamlined for monitors moving forward. Great, thanks Elizabeth. And Debbie, what about boosting efficiencies related to monitoring informed consent with electronic eConsent? Certainly, I think we’ve alluded to a lot of the added efficiencies. Less administrative time for example. Everything is done kind of for you, and you can move to that next step. Instead of completing your spreadsheet, you can be reviewing what has been tracked within the system. It also facilitates the process of the study, giving automated reminders, some systems can do that, send alerts to study teams when a new consent is due, when a patient does reach that age where they need to re-consent. And also it gives you reports that you can look at as well in preparation for a site visit. So it certainly makes this whole tracking process a lot simpler. Another added feature is, I mentioned earlier, you can’t always be sure you have a lot of faith when you go to look at source document verification that it was done appropriately, the process was done. And a lot of sites have reverted to using these templates which really don’t give you much added information. I mean they’re perfectly fine, they meet the basic requirement, but would the automated system, there is a diary or journal system generated in the back, and you can actually see that patients are moving from one page to another, that they’re finding questions. So you really can see the interaction that the potential subject is having within the form. So I think that gives you a lot more confidence in how that process is proceeding. Another efficiency, as Elizabeth had mentioned, is reviewing all of this ahead of time and preparing and targeting what you need to focus on on site makes that time on site much more efficient. I agree. There is a big move to source data verification decrease and more time at site for quality management and oversight and working on the quality of the performance. And do you have another comment before I go to the next one? I think I interrupted you, sorry about that. Anything else? It’s Elizabeth. Debbie I’m sorry, I didn’t mean to interrupt you. I just wanted to say that it can also increase efficiency related to the other monitoring, such as the close-out visit. Because if you’re being able to look at informed consent ahead of time and get that completed, it creates less time on site which is less cost, especially when close-out visits can be very fast paced and require a lot of time and money. So, another efficiency. Just that there is the advantage of remote, as well as to dig deeper into the system and get a good sense of what’s happening in that consent process. I agree. So the insight of what really the reconstruction. So it sounds like from what we’ve heard from you guys related to the benefits of this is we definitely talked about cost, talked about time saving, and also boosting efficiencies in many many areas. One thing I wanted to spend just a few moments talking is protecting patients’ privacy, and I know that the concern about having anything on an electronic system, so making sure that these systems are in compliance with the different regulations for e-systems, but as well as also privacy. And really the global landscape is quite complicated related to regional requirements for privacy. So the efficiencies, and the cost, and you know, looking at time, when we can remotely review the informed consent or informed consent journal, as Deb mentioned, would very much support all three of those things. The challenge is, in different parts of the country and/or world and/or related to site privacy policies, the remote review of the subject’s name and the signature might be something that needs to be restricted. So using and knowing what the eConsent system can do related to partitioning protected health information, how it’s encrypted and where it’s stored at servers are all very important information. So the monitors, sometimes the monitor will remotely be able to review the full consent, the journal, depending on if the patient gave permission and it’s allowed per regulatory requirements and the site is satisfied with where that monitor is going to be monitoring—like, not at Starbucks, for example. So there are certain organizations that have created secure areas where monitors actually review information. But even if we can’t see the protected health information, there is a ton of data that Elizabeth and Debbie have talked about throughout this presentation that we have available to us that we’ve never had before, that does not include protected health information, so how the patient went through the process, when did they log in, what kind of questions they had, how do we test their comprehension, maybe they have the knowledge checks, was there any kind of system facilitation of Q&A. So this is again a difference that even if we can’t see the full signed version remotely, there is so much we can see, and the tracking of who’s consented or reconnected as well. So I just wanted to reiterate some of those key points there. So then, we have a few more slides left before we get into our Q&A, and I wanted to pull this all together and then ask Deb and Elizabeth some closing crystal ball questions, like what they foresee, if they have to say two things, what would they think is going to happen. You know, we saw the polling questions that people had answered on the call today, and so we have not a lot of experience in the audience. And so crystal ball, we’ll ask our experts. So one thing to consider before implementing eConsent solutions is again we need to make sure that we build and think about where this would impact our procedures and validated methods. What are those things that we would have to update and where is the impact. So there might be new procedures, there might be more likely things that need to be updated related to monitoring. And then, how we document monitoring process will be impacted in relation to informed consent oversight. So where would that be impacted in your annotated report templates, maybe the report questions, I can really very much see site initiation questions, some of the questions being tweaked a little bit and site qualification business especially. And then training, how would we need to make sure that monitors are trained on what does it mean to monitor an electronic informed consent versus paper. It’s very important to help with the consistencies. You know, the inconsistency in monitoring with paper, we want to decrease that risk, so we we want to make sure that doesn’t happen in different ways with electronic. The training of sites also, but we’re on monitoring today. And then of course we know that, at least in the industry, we were doing a lot more use of electronic systems, so hopefully our standard operating procedures and other things we do about validation of computerized systems and review of our vendor standards, we already have that in place for this. The big difference again is, when is the use of the electronic system happening. And it’s happening, you know again, starts before consent, because it is consent. So think of again how you would implement your quality system as your quality control day to day, the day to day activities of your monitors would be very much impacted related to consent. And then your quality assurance, how this impacts your quality assurance within your organization when you have eConsent within a trial. Now those of you on the call that are from the site perspective, the same kind of impact analysis can be done. So go through, these are the components of any stakeholder that works within clinical research that they need to have a place to support implementing electronic systems to do something that’s required by a regulation, something so monumental as consent. So we’re going to give a few chime-ins for a crystal ball check in. So any closing words of wisdom from Elizabeth and Debbie, and then we’ll get into our Q&A, because I want us to have good time to do that. Elizabeth, anything that you wanted to say, you wrote down in your notes, and you didn’t get to say? And anything about crystal ball? Well I’m just excited because, like Debbie said, patient education and awareness is a passion of mine. I try to talk about it in what I write, what I speak about. And I’m excited about eConsent because I think it’s going to really promote patient education. Patients are going to go in and be aware of their responsibilities as a study patient. They’re not going to be doing something because they feel like it will please their doctor without understanding. They’re going to understand their role, risks, and benefits, and they can make an informed decision about participation. And the staff is involved in that conversation, and I’m excited about that opportunity that eConsent is going to facilitate. Wonderful. And how about Debbie? How about you? Yes, I couldn’t agree more, Elizabeth. I kind of look at this, how does this impact the subject, how does it impact the site, and of course the monitor. And I think it adds efficiency, not just efficiency but also more information. Instead of the paper consent kind of happening in some closed office somewhere, a lot of the eConsent versions actually have more interactive—for example if there is a question, you flag it, the subject can flag it, and you can see when the coordinator addresses that. So you get a whole lot more insight into that process, which I find very exciting. But I also think in terms of, you know, we are moving to more electronic systems in clinical research. And I think this is just another one, and once we gain experience using it and once we get over what I think is a little bit of fear of the technology, I think that it’s really going to facilitate the process. And we can also get better about our subjects being protected as well as meeting our regulatory requirements. Thanks. I’m sorry I got trigger happy with my finger going to the next slide, it’s not intentional. So thank you for that. And I think you summarized those important points very well. This is our last polling that we’ll do before we go to the Q&A. So from what we presented, and even before you came onto the call, can you see the benefits of using eConsent solutions to support the job of a monitor? What do you guys think? So if you’ll answer this question, based on what you know, and I think you’re on the call because you understand the job of a monitor, would an electronic solution help the monitor do their job—maybe save time, save money, spend more time with sites, and not look at any data that they’re not supposed to because there’s no consent, making sure we have that in place. All right, let’s see what we got. Make sure you hit submit. The blue line got bigger on that one than the green line. So we’re happy to see that. As we get into our Q&A, I wanted to take the opportunity to mention that TrialConsent is CRF Health’s solution for eConsent. And it’s based on their experience with the eCOA TrialMax solution. So it’s an electronic based solution, a web-based solution that you can access from really any computer securely. And it does support really the whole process of consent related to development of the consent—that’s the Trial Consent Designer™ on the lefthand of the screen, a collaborative tool to design all the way from global to the site level consent, and also can have an IRB do actual review what the patient would see. And then web-based again can be done on a tablet or a home computer, so trying to support the ability for a patient to start consenting and reviewing something at home. I know we do that a lot with paper already. And then on the righthand side is something that Deb and Elizabeth talked a lot about related to the tracking of eConsent, so it’s the TrialConsent Manager™ for sites and for the sponsor. So I wanted to thank our speakers, and I would like us to go into our Q&A. Have you experienced IRBs or IT departments seeking evidence or assurance that patient data is stored securely? I can speak to that. Absolutely. Working with the IRBs as soon as possible early on in the process, as soon as you’re considering using eConsent and you tend to use the same IRBs in most of your projects, start talking to them right away about they may already have processes in place. I know at CRF Health we anticipate this and we really know the kinds of questions that IRB needs to know and related to our security of our systems. Let’s go to the next question, let’s ask something even more related about monitoring. In some countries, it is required for patients to put their initials in each page of the ICF. Is this need considered in the eConsent tools? Great question. It’s interesting, we could kind of debate if that’s a local requirement or an ethics committee requirement and what those initials are meaning. And in an electronic system, as they compete a review or scroll down enough on a page, the systems are designed that they have to tick a box, and it might have an affirmation with it confirming that they’ve reviewed to their satisfaction and indicated where they have questions. And typically it’s meaning the same thing as those little initials. And Debbie and Elizabeth, how do you feel about those initials on every page? Any problems with monitoring those? Sure. Yes, that’s just another burden and if they miss a change, well you know, that’s a violation that’s reportable, that’s a CAPA. The way most systems are designed, they can’t move on to the next page until they have already indicated that they had no questions on that page and can move forward. It’s kind of done for you. What has your experience been with the global adoption of eConsent? Do you guys want to take this, or do you want me to go? I think as Sam mentioned, Transcelerate did a survey and they had 29 countries that submitted and that was in 2016. And I’m pretty sure they’re just putting out another survey regarding eConsent. But it does seem to be accepted and it depends of course which countries you’re talking about and what their processes are. But as experience grows I do see this becoming much more accessible across the board across the world. Yes Elizabeth, I agree too. And the thing to remember is, certain components of an eConsent might be that barrier of acceptance, but you could have a hybrid approach. So for example, some countries e-signature is not accepted. So you just would want to make sure it’s a solution that has that flexibility. Great. Thank you very much for all the questions that we’ve received today. And I’m sorry but we have to wrap things up here, we are all out of time. So that just leaves me to thank our speakers for the great presentation. And thank you very much to CRF Health for sponsoring today. To all attendees, you will receive an email, you have access to the on-demand version of the webinar if you’d like to re-watch it. You can also get that on our website, that’s www.business-review-webinars.com. And when you’re watching the on-demand version, please continue to ask questions, vote in the polls, and interact with the widgets, it does remain interactive later. We do look forward to sharing further webinars with you, keep an eye on the website just mentioned. And you can also follow us on Twitter @BRWebinars for daily updates, and you can join the LinkedIn group as well, Business Review Webinars, to stay up to date. Thank you all once again, and I hope you all have a lovely day.